As function-conscious consumers, we enjoy personalization options and advanced features that help us get the most out of products. With the broadening market for adjustable beds and other motion furniture, products are being adapted to suit our expectations. Let’s take a look at some of those technological advances. For most people, the decision to get a power bed is a lifestyle choice. We all use our beds for more than just sleeping. We watch TV, read, surf the Internet, relax. Power bases can adjust to nearly unlimited positions – not only for convenience but to provide you with ideal comfort. Power bases are compatible with many kinds of mattress – innerspring, foam, air – so you don’t have to give up your favorite support. Some models even allow partners to adjust their own sides of the bed. Proper positioning can help alleviate many conditions that interfere with quality sleep. People who suffer from sleep apnea or acid reflux find benefit from sleeping with the head elevated a few degrees. Raising the head and feet helps improve circulation. The spine has a slight S-curve, so reducing pressure on joints and muscles relieves pains caused by improper alignment. Keeping the body in the proper sleeping position can help with asthma, snoring, and other breathing difficulties. If you’re comfortable, you rest better! In the age of the laptop, iPad and e-reader, we’re seldom far from our gadgets – including when in bed. Tech-savvy consumers can download iPhone and iPad apps that let you operate your bed as well as other electronics in the room. Turn off the television, adjust the lighting, or elevate your partner’s head to stop them snoring. Those without iPads are not left out. Wireless remotes, programmed settings, and massage features are designed to give you an upgraded and personalized sleep experience. Timers can be set for massage, audio alarm, massage alarm, or to return the bed to a flat position after you’ve fallen asleep. Other features are designed with safety in mind, such as under-bed LED night lights to help you navigate in the dark. Some systems are equipped with sensors that help prevent people or pets from being pinched when the bed is changing position. You may also find a power failure feature – if your electricity goes out, the base automatically returns to a flat position so it’s easier to get out of bed. If it’s time to update your recliner, power reclining chairs also offer versatility of comfort as well as all the bells and whistles for optimal relaxation. Slightly elevating both the head and feet minimizes the body’s resistance to gravity and creates a weightless sensation. This is known as the zero gravity position. As with adjustable beds, the same therapeutic benefits apply when legs, neck, and back are all supported to reduce stress on all joints, muscles, and nerves. Space-saving wall hugger mechanisms allow chairs to fully recline even when they’re positioned close to the wall. Other conveniences you’ll find include cup holders, tray tables, heat and massage. Recliners, too, can accommodate your favorite devices. 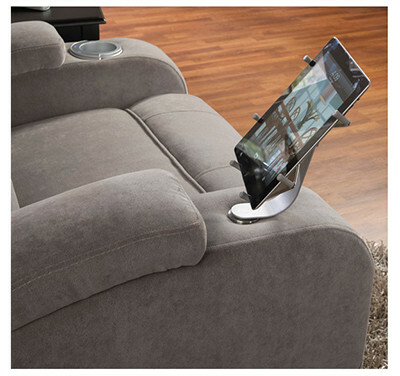 A tablet or e-reader holder can swivel, rotate or lay flat for just the right hands-free angle. Use your iPad as an extension of your TV remote and select movies or adjust the volume. For an enhanced home entertainment experience, reclining theater seating comes with options such LED lighting to help find your seat, cooling cup holders and removable tray tables for snacks, and even speaker systems that amplify sound right through the seat so you can feel like part of the action of your movie, video game or sporting event. Put your feet up or tuck yourself in and enjoy the all the benefits of living in the future.